Man-Made Global Warming: Is It for Real? When Sally Fernandez wrote and published her title, Climatized, I wonder if she fully realized the impact it could have on the average reader, a reader like me? I've heard a lot about global warming over the years, how mankind is to take steps to prevent the situation from becoming worse. We have been educated to change various elements of our lifestyles in hopes that a combined effort will enable our futures not to look so bleak. However, speaking solely for myself, I cannot help but wonder if Climatized has a great deal of merit within its pages, a fictional thriller told with a (possibly) intended purpose of educating the average reader to go against almost everything the media has been teaching. 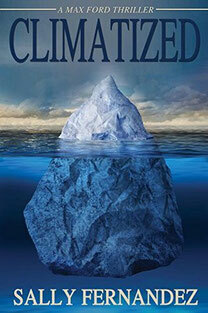 Regardless, I enjoyed reading Climatized, even if solely looking at it as a political thriller. People from various walks of life, with shared knowledge, are being snuffed out to keep them silent. If anyone challenges what the powers-that-be want to remain quiet, they pay the price with their lives because their challenge becomes a threat. Maxine (Max) Ford was hired by one widow who didn't believe things were as they seemed and, as Max dug deeper into the events which transpired and learned of connections between a few select individuals, she knew there was a conspiracy - then set about finding out how far up the political ladder the corruption went. I was thoroughly taken in by Climatized. The pace was steady and I was kept on edge for much of the story. I will definitely look forward to reading future Max Ford thrillers. If you are interested in learning more about the book, just click on the book cover above and you will be taken to the book's page on Amazon.